Janet Kennedy, Ph.D. is a licensed Clinical Psychologist with years of specialized experience in treating sleep disorders. For the past decade, Dr. Kennedy has been helping individuals and families break out of the cycle of bad sleep through her work at NYC Sleep Doctor. Dr. Kennedy creates tailored treatment programs–using scientifically proven techniques–and provides the support you need to succeed in reclaiming your sleep. We all know that sleep is essential to our health and daily functioning. But when sleep becomes elusive, our coping strategies can make things worse. Whether you’re struggling with your own sleep or you’re a sleep-deprived parent, don’t settle for exhaustion. Sign up for Dr. Kennedy's mailing list and be first to hear about her upcoming podcast. 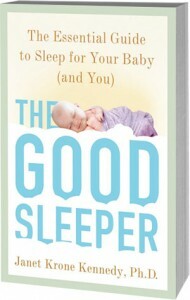 A refreshingly straightforward method for training infants to become great sleepers for life, inspired by clinical psychologist Janet Kennedy's popular psychotherapy practice, NYC Sleep Doctor. Available in bookstores and online.